Jack Lengyel has had a long and distinguished career in collegiate athletics. 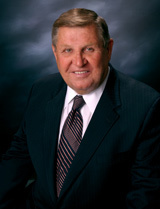 Mr. Jack Lengyel, who began his career as the freshman football coach at his alma mater Akron University, has been involved with intercollegiate athletics since 1957. Mr. Lengyel’s diverse career has taken him from the gridiron to the administrative ranks to the private sector. As a coach, Mr. Jack Lengyel served as assistant football coach at Akron (1959), Heidelberg College (1961-62) and Cornell (1963-65). Mr. Lengyel was named head football and lacrosse coach at the College of Wooster in 1966 and remained there for four years. However, Mr. Lengyel’s greatest task and achievement as a coach was rebuilding the football program and community at Marshall University after the tragic airline crash involving the entire team. Mr. Lengyel was head football coach at Marshall from 1971 to 1974. Warner Brothers produced the movie “We Are Marshall”, starring Matthew McConaughey as coach Jack Lengyel. After three years in the private sector at Gamble Brothers, Mr. Lengyel moved into the intercollegiate athletics administrative ranks as the associate director of athletics at Louisville (1980) and the University of Missouri (1981-84). Following his stint at Mizzou, Mr. Lengyel was named the director of athletics at Fresno State, which won the men’s basketball NIT Championship in 1984. Mr. Lengyel returned to Columbia, MO as their director of athletics in 1986. Following his three-year stay at Missouri, Mr. Jack Lengyel was named as the director of athletics at the United States Naval Academy. Mr. Lengyel remained at Navy for 13 years from 1988 – 2001 and oversaw a 30 sport athletic department and was responsible for major sports facility new construction and renovations. During his tenure at Navy, Mr. Lengyel received a Lifetime Service Award from the Annapolis Touchdown Club (2001), appointed to the US Naval Academy Foundation Board of Trustee’s (2001) and the athletic training facility was named in his honor. Following his retirement from Navy, Mr. Lengyel has been active as a consultant and serving in leadership positions in various community and professional organizations. Mr. Lengyel has served as the interim athletics director at Temple University, Eastern Kentucky University and the University of Colorado providing leadership and stability through the administrative transition. Mr. Jack Lengyel has used his vast experience to provide strategic operational reviews and analysis for Towson State, Northern Arizona University and Texas State University at San Marcos. Active professionally and within the community, Mr. Lengyel has served in leaderships positions in the National Association of College Directors of America (NACDA), the Division I-A Director of Athletics Association, the National Football Foundation and College Hall of Fame, the United State Sports Academy, the College Football Association and the NCAA Committee Membership to just name a few of the professional organizations that Mr. Lengyel has served. Among the honors and awards presented to Mr. Lengyel during his illustrious career include the John L. Toner Award (2005) and the Outstanding Contribution to Amateur Athletics Award (2005) presented by the National Football Foundation; The Homer Rice Award (2005) presented by the Division I-A Athletic Director’s, and NACDA’s James J. Corbett Award (2001) to just name a few of Mr. Lengyel’s honors. Mr. Jack Lengyel earned his bachelor of science from Akron University in 1957 and has a master of education degree from Kent State University. Coach Jack Lengyel is best known as the head football coach who took on the daunting task of rebuilding the Marshall Thundering Herd football team after the tragic plane crash of November 14, 1970; a crash which killed all 75 people on board. The movie, "We Are Marshall," debuted in December of 2006, and stars Matthew McConaughey as Jack Lengyel.